Who doesn’t know Heineken, but what’s the story of this world famous beer. 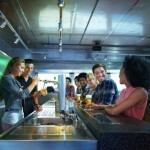 At the Heineken Experience you will learn everything there is to know. You can even be dropped of in front of the door with the hop on hop off canal cruise. 1. 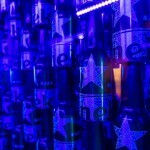 What is the Heineken Experience? 2. What can you expect? 4. How much is the admission fee? 5. What are the opening times? On the edge of the center at the Stadhouderskade you can find Heineken Expereince. As one of Amsterdams most popular attractions, there are often queues to get in. But how did it all started… From the year 1863 Heineken started to brew their beers at this brewery on the edge of the city. 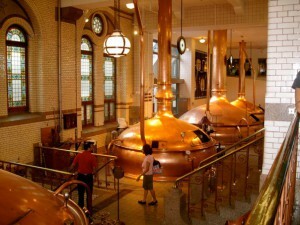 After more than a century Heineken closed their first brewery in 1988, as the factory wasn’t able to meet the high demands anymore. 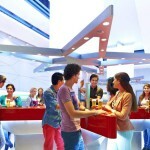 Three years later Heineken opened the Heineken Experience and the public could experience Heineken and its history. Experience the story of the Heineken beers. 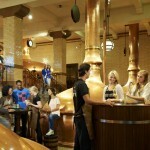 Spread over four floors you can discover all processes of brewing a Heineken beer. You will be learning a lot about the brand in just 90 minutes. You can have a look in the old brewery and you’ll still see the huge coper kettles, which they used over the years. In the laboratory they will lift a secret and tell you about the four main ingredients they use for their beers. After this visit you should know how beer is made. The Heineken Experience also shows you some details about their partnerships, with brands as: UEFA Champions League and James Bond. There is also an interactive area, where many advertisements are shown they’ve used throughout the years. At the end of the tour you will be awarded with two refreshing Heineken beers and you can discover how to pour the perfect beer. – There is a free mobile app available, which can be very handy and informative on your visit. Don’t worry it won’t consume your phones data package, since you can just use their free wifi. – Tickets can also be scanned from your smartphone or tablet. – Children under 18 are admitted only if accompanied by an adult and do not get any alcoholic drinks. – Friday to Sunday: 10.30 – 21.00, last admission at 19.00. – Daily: 10.30 – 21.00, last admission at 19.00. On December 24 and 31 last admission is at 14.00. 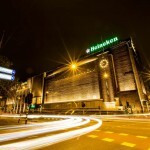 The Heineken Experience is located at the Stadhouderskade 78. – It is approximately a 10 minute walk from the Leidseplein square. You should follow the street the Weteringschans and after a while you’ll see the attraction on your right hand. – It is approximately a 15 minute walk from the Rembrandtplein square. You should follow the streets Reguliersdwarsstraat and then take the Vijzelstraat to the left. After a while you’ll see the attraction on your left hand. It is approximately a 15 minute journey from the Central Station. You should take tram 16 or 24 from the station and you will have to go out at the stop Stadhouderskade. It is approximately a 10 minute journey from the Ring A10. You should take exit s103 or s114 and follow the signs for city ring s100. The Heineken Experience is located directly at this road. It is also possible to get here by boat, then you should use a hop on hop off canal cruise.